In the past, I’ve often referred to the simplicity of Electro’s origin story. 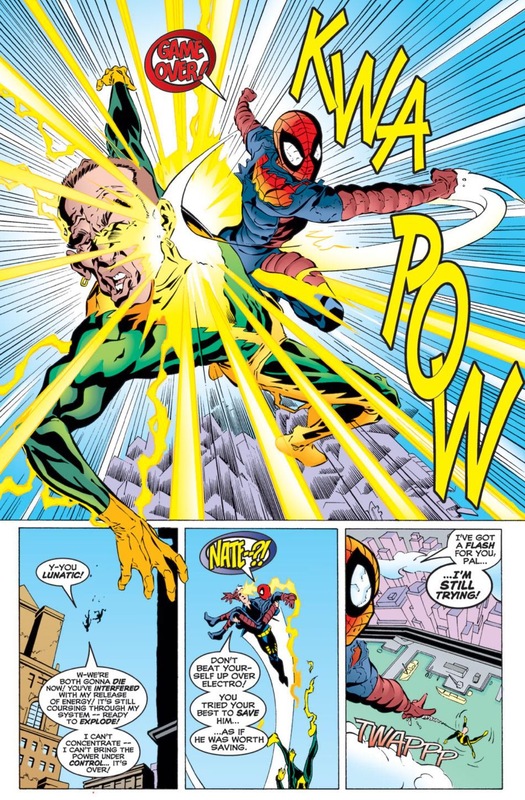 When the character was first introducing in Amazing Spider-Man #9 it a no fuss, no muss affair – an ordinary lineman Max Dillon gets extraordinary powers, and as a contrast to our titular hero Spider-Man, decides to use those power to rob banks and be a criminal. But I understand that comic book creators can only do so much with a character who doesn’t have many layers of complexity. Electro couldn’t have possibly stayed simple forever. 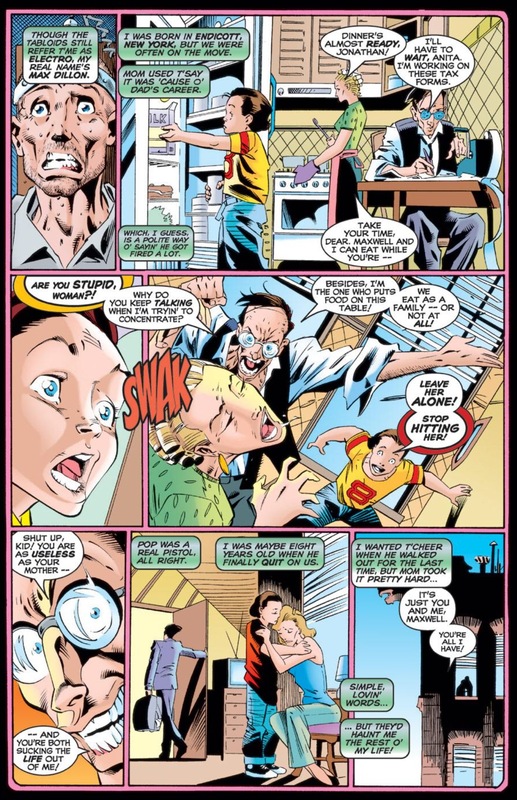 The Tom DeFalco-scripted 1997 arc, “The Rebirth of Electro,” which was featured in ASM #422-425, demonstrates both the good and not-so-good of taking an old Silver Age villain that has been essentially operating aimlessly without real incentive, motivation or direction for decades, and giving him more depth. 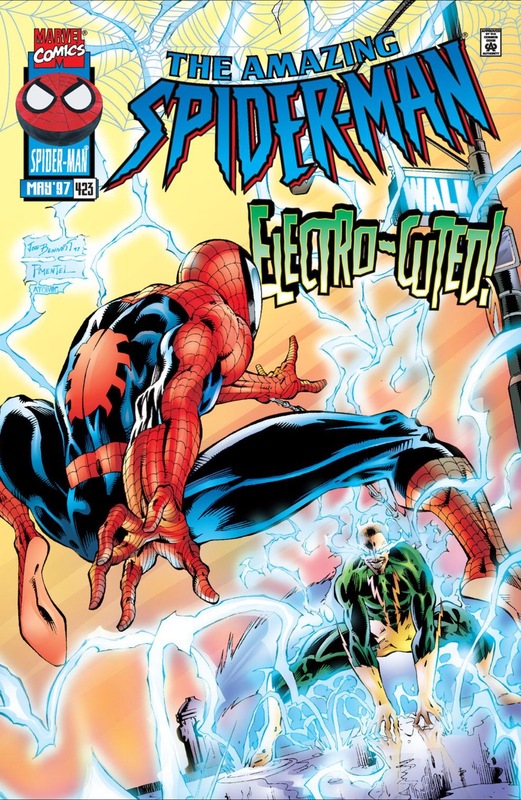 As for the good, the storyline – which, oddly enough is one of only a small handful of Spider-Man vs. Electro (one-on-one) stories in the history of the ASM series – is very insightful in how it explores Electro’s inadequacies and self-doubt. After long being portrayed as a bit of a loser that has only been able to get the better of Spider-Man under extraordinary circumstances, Electro is given a brand new lease on life when the Rose supercharges him and unleashes the villain on the world (all in an effort to empower his side in the burgeoning gang war with the Black Tarantula). This all-new Electro is incredibly powerful, capable of using his ability to manipulate electricity as a means to wipe out an entire New York City block. 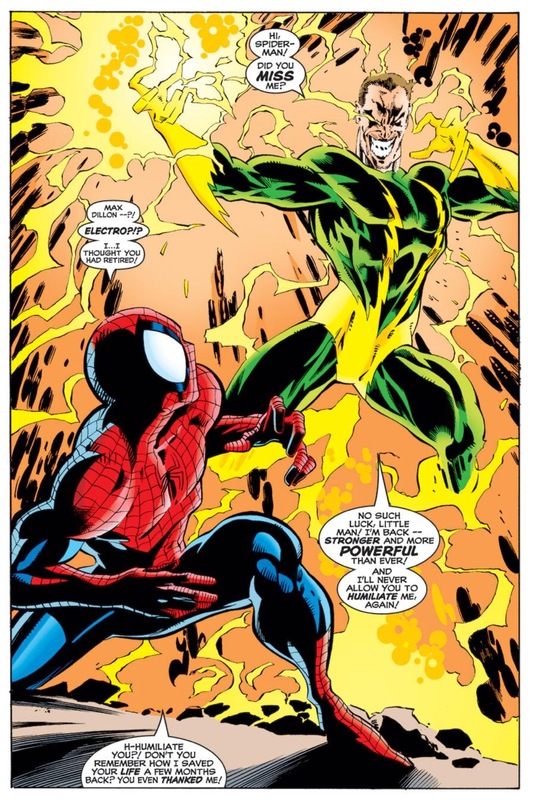 In his first confrontation with Spider-Man in ASM #423, Electro so overwhelms our hero (who is admittedly not feeling right after being bitten by Morbius in a prior comic), he demands Spidey to “beg” for mercy or he’ll kill him and everyone else in the vicinity. 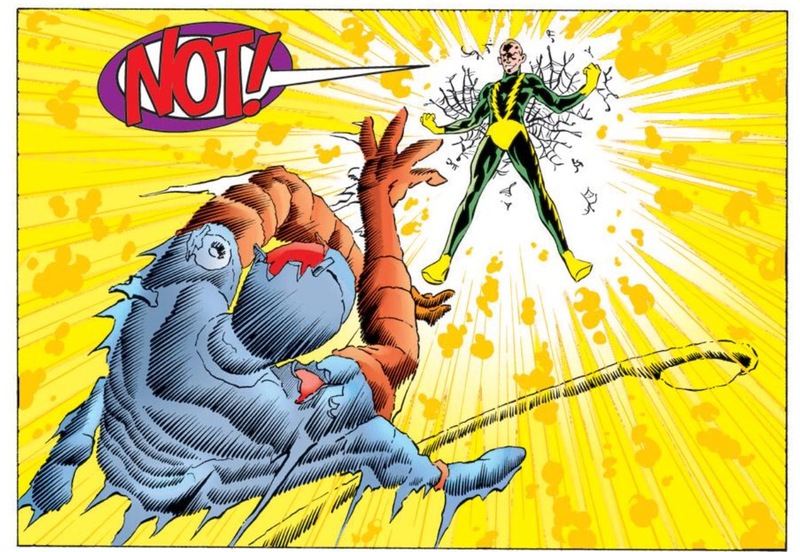 Spider-Man’s reaction to Electro here doesn’t sit quite right by me. 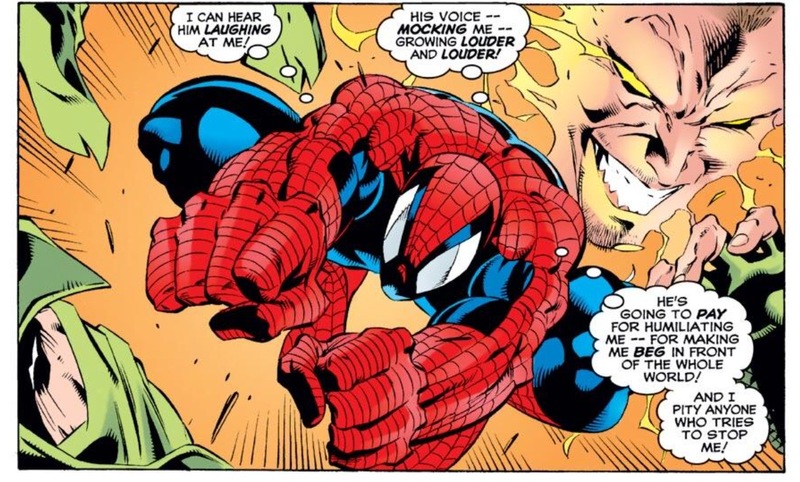 Spidey does indeed “beg,” but rather than letting him save some face by portraying him as pleading with Electro to spare the lives of innocent New Yorkers, Spider-Man does in fact say that he, personally, doesn’t want to die. For Spider-Man fans, this might be one of the lowest moments in the character’s history. But if you’re a fan of Electro, this might be his greatest triumph in comics. Spider-Man is so distraught by his cowardice, he is haunted by it throughout ASM #424, which functions more as a standalone story involving Spidey and Elektra teaming up to take on some of the Black Tarantula’s ninja assassins. Still, in addition to leeching off of some of Elektra’s popularity to move some additional Spidey comics, giving readers one issue away from the central Spider-Man/Electro feud is actually an effective way to build tension for the inevitable round two in ASM #425. It gives Spider-Man time to contemplate how he’s going to take on and defeat one of his oldest enemies who has now evolved into a powerful new menace. As a result, the subsequent battle we get in ASM #425 is a quite satisfying showdown between these two old rivals (and one that, in retrospect, feels thematically similar to what we got in Marc Webb’s The Amazing Spider-Man 2 film). Readers are also treated to an Electro filled with hubris, a radically different take on the character, who operated more as a bumbler during the Silver Age. 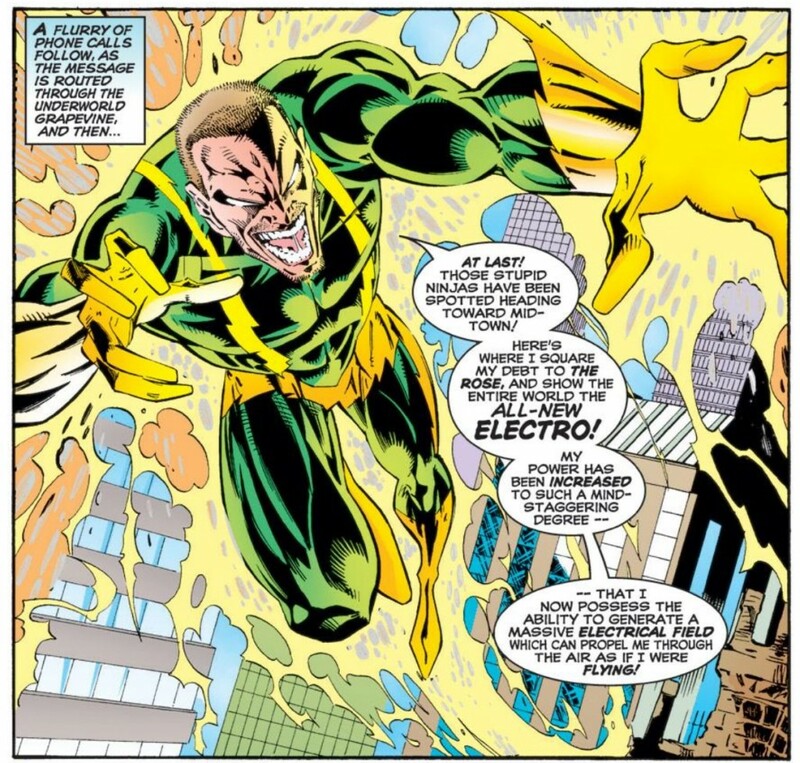 Credit also goes to DeFalco, and the issue’s art team of Steve Skroce and Bud LaRosa for one very little storyline development that ends up being a very telling detail about how Electro has grown from previous iterations: he never dons his trademark yellow lightning bolt mask. Why would a non-masked Electro be pertinent? I’m sure I’m not the only Spider-Man fan out there that has long felt that the initial Electro costume was just a little bit goofy. 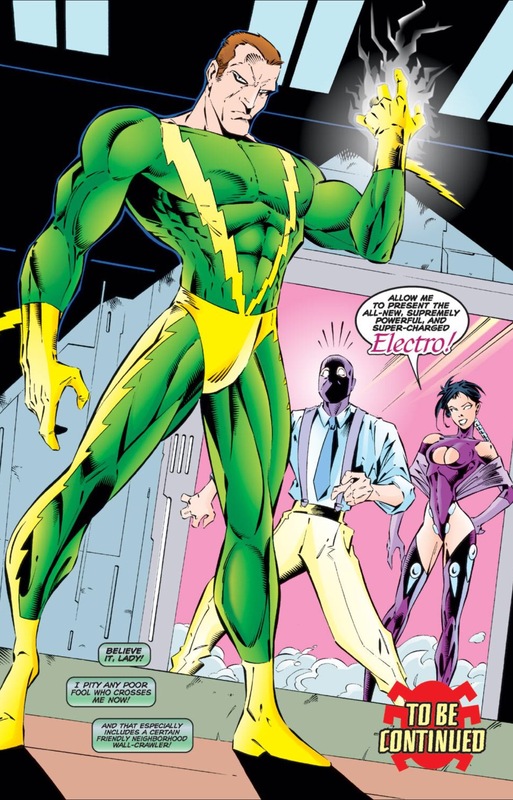 I think it speaks volumes that when Electro was rebooted in the Ultimate universe, Brian Michael Bendis and Mark Bagley did away with his Silver Age attire. And of course the cinematic take on the character further backs away from the yellow and greens. By dropping the mask in “Rebirth of Electro,” it demands that the readers take Electro more seriously this time around. In another demonstration of the stakes being higher, in ASM #425, Spider-Man arrives at the scene in a brand new insulated costume and with his newfound friend Nate Grey, aka X-Man. When has Spider-Man ever required backup for a fight against Electro? And why go through all the trouble of developing a new suit (though Spidey just appears in the costume rather than having any face time that shows him creating it) if Electro didn’t pose such a considerable threat? And just to show how his success a few issues earlier has gone to his head, Electro laughs off Spider-Man’s resourcefulness and his teammate. So when Spidey eventually does get the better of Electro (via a well-time rock to the head), the victory feels earned, rather than obligatory. But I can’t say I liked everything about Electro’s makeover in this storyline. The opening issue of the arc goes through the paces of adding more detail to Electro’s origin story, and while there are elements to DeFalco’s script I find appealing – notably this idea that Max’s prior failures as a villain are rooted in some deep-set insecurities – there are other parts that feel quite clichéd. Namely, why does every single comic book character that is emotionally damaged in some way, whether it be Electro or Mary Jane, have to come from a broken family? There has to be another way to develop a character rather than giving him a set of abusive parents that either physically beat the character or emotionally torment him (or both). Perhaps this is just 20-20 hindsight talking, but even when it’s done well, the premise still feels like a copout. My bristling of poor little Max’s family dynamic aside, “Rebirth of Electro” still stands as one of the better Electro vs. Spider-Man storylines. I’m somewhat fascinated by the fact that Marvel created this villain in 1964 that is capable of controlling electricity (a somewhat potent powerset) and still accomplished very little with him until more than 30 years after the fact. I still maintain that the character’s initial simplicity is very satisfying to read about as one part of the entire Stan Lee/Steve Ditko run on ASM, but one would think some of the details that are fleshed out in “Rebirth of Electro” would have been addressed years before this storyline saw the light of day. This is a good story, and my first exposure to Electro outside of Lee/Ditko reprints. I always loved the visual of Dillon strapping himself to an electric chair to recharge, equal parts dramatic and silly. Having said that, I’ve never liked the “supercharging” trend with Electro, whether here, in the Gauntlet, or the current storyline. It’s hard to accurately demonstrate how his power set changes from one new power up to the next, leading to lots of “telling, not showing” moments. His abilities all -look- the same on the comics page. A friend of mine accompanied me to ASM2, and made a similar point. He felt the final battle with Electro wasn’t as impactful as the one with the Lizard, because while the audience could see how much Spidey was getting whaled on in the earlier fight, all you get from the Electro fight is shiny lights flying into the hero. Intellectually, we know he’s hurt, but by the end of th battle, he doesn’t -look- damaged. I liked these issues a lot! These came out around the time I seriously started collecting comics. I found the reason why Electro doesn’t accomplish much is due to his lack of self confidence to be a brilliant and elegant solution. I am also pleasantly surprised that the plot thread was picked up again during the Gauntlet storyline. These are part of the 5 issues I’m missing in the 400s. On my short list of issues I want to get this year. I still can’t wrap my head around the fact that people want more for ASM 430 and 431 than I paid for ASM 121 and 122. Four words. Carnage and low print run. Once someone labels those two words on one comic the speculators run rampant. I know. I’m kicking myself for waiting in these issues for so long. Maybe Carnage’s popularity will take a dip eventually. I’m still very much in the hunt for 431 myself. I’m not paying 40 bucks for it. At least I lucked out on 430, picked that one up newstand fresh back in the day. I’ve always enjoyed stories exploring the backgrounds and motivations of the villains and supporting characters. I’m sucker for that kinda thing. I like villains to have real names and a history, not just a list of fights they’ve lost. Additionally, when the villain wins every now and then, I think that allows them to be taken much more seriously as a threat.